The first time we talked about this freebie was way back in the middle of 2010, now they are releasing the free offer again (albeit without the magazine). 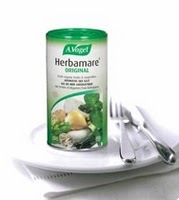 Customers can once again get a free sample of Herbamare (courtesy of their makers; Vogel). Herbamare is a “blend of sea salt and 14 organic herbs that can replace regular salt on foods.” The sachet we received when we ordered this freebie last year was good enough for a few servings, about half the size of the ones you get from the supermarket. Filling out the form at the avogel.com website takes about 1 minute (even less if you use the google auto-fill on the toolbar). One sample per address and you don’t need to sign up to their monthly newsletter to get the freebie. If you browse their website you will also notice they are running a competition (if you are into that sort of thing). No one we have spoken to knows when this offer will end, maybe it never does.